As opposed to our standard news releases, we have decided to make the account of our travels to Scotland less formal. I promise that we had every intention of releasing these at the end of each day during our trip. Honestly. However, the tight schedule, travel and lack of sleep quickly caught up with us. What time we spent at our hotel involved going to bed. With the amount of things that we experienced, conversations that took place, and information that was shared, the time simply did not exist to write these reports on the fly and post them. When we asked for a full rugby immersion, Scotland delivered. And then some. So, I apologize for the delay as it has taken me over a week to begin to digest all of what we experienced. Over the next few days we’ll post a full account of our voyage to Scotland in the name of rugby. I had planned to include them all in one long post, but when I crested 1000 words covering Day 1, there was no choice but to split it up for the sake of the sanity of everyone that reads this log. We hope that you enjoy the account of our travels. Feel free to contact us with any questions. We intend to honor the hospitality that we received by sharing everything that we can with other clubs interested in growing and learning. Growing the sport here in the USA is what matters the most to us, not hoarding information to ourselves. We highly recommend that every club invest in some sort of rugby immersion experience regardless of where it takes place (yes, they can be had in the USA). The experience was invaluable for us. If you want something, go get it. Don’t wait for someone else to give it to you. After a short layover in Dublin, we arrived in Glasgow early in the morning after a mostly sleepless flight over. 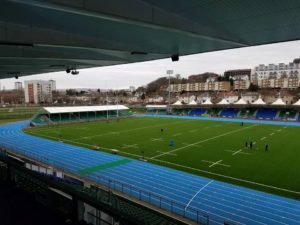 Tails dragging, but spurred by excitement we dropped off luggage at our hotel, ate some breakfast, and made our way to Scotstoun Stadium, home of the Glasgow Warriors. We were met by our liaison Madeline Hoyle, an intern from Syracuse University. We were led up to the upper level of the stadium and began to watch the Warriors prep for their Friday night match against Scarlets. We were met by Warriors’ Managing Director, Nathan Bombrys, whom was the man responsible for making the entire trip a reality. We observed the training session, which was a Captain’s Run, all while continuously meeting Warrior’s coaches, support staff, and players. USA Eagle Greg Petersen, who is recovering from an injury and should be cleared to play again soon, stopped in for a chat with our group as we had the best seat in the house… the view from Nathan’s office. Nathan provided a detailed tour of the stadium, from top to bottom, and continued to introduce us to every person we came across regardless of their position within the club. We were lucky to catch Scottish International Jonny Gray as he had stopped by the stadium to pick a few things up before leaving for France for their 6 Nations match on Sunday. Upon visiting the club physiotherapy room, we got to me the Warrior’s lead physio Nicola McGuire. We had a “small world” moment as she went to High School in Apex which is about a half an hour from Clayton. We ate a wonderful lunch with the team and had a chance to meet and speak with more players and coaches, including Head Coach Gregor Townsend whom is soon to take over as Head Coach of Scotland. Side note: Glasgow second row, Brian Alainu’uese might be the largest person (height/weight combination: 6’8″, 135kg) I’ve ever met. He is massive. The prevailing question from most of them was regarding rugby in the USA and our growth, especially at the youth level. Everyone is keenly aware of the potential for rugby in the USA and are watching. After lunch, we continued our tour, exploring the lower levels of the stadium and meeting with more coaches and staff. Everyone within the organization, from top to bottom, was incredibly gracious to share their time. There is a heavy emphasis on rugby culture within the Warrior’s setup. 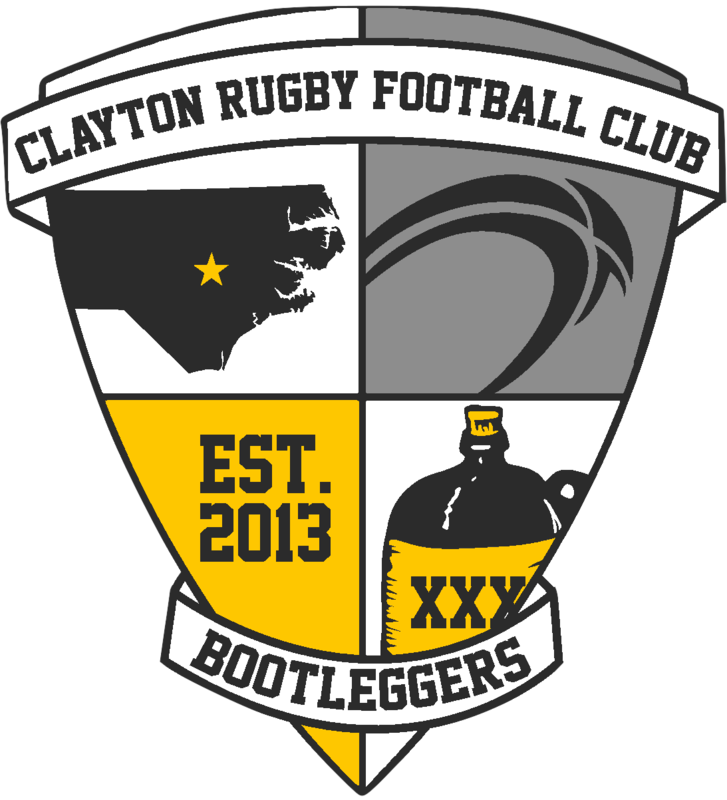 Respecting and honoring the past, positive values, hard work, family… all things that can make a difference for any rugby club. The halls of Scotstoun are lined with pictures of current and former players. The smallest things matter to Nathan and the Warriors and there is little question that this has come into play in their recent success in signing extensions with players that were being courted by larger clubs in England and France. One particular bit that resonated with our group is that there is an expectation within the club that everyone shakes hands and greets someone the first time they meet them each day. Doesn’t matter who they are or who they come across. Even when it is a bunch of guys from North Carolina…. Handshake and greeting. Small thing, but big effect on culture. Something every club can do, professional or not. 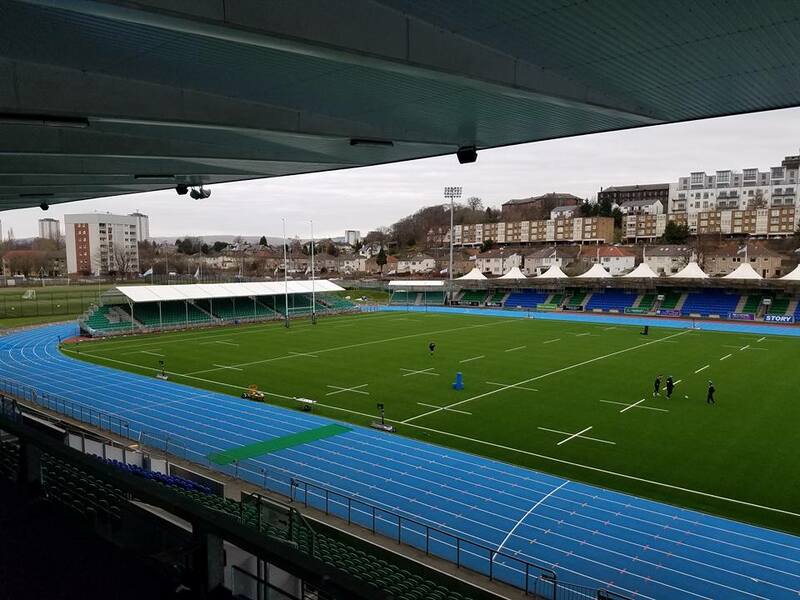 Our last stop at Scotstoun was their coaching command post. The staff was knee deep in preparing for Scarlets, but Warrior’s Lead Performance Analyst Gavin Vaughan took a great deal of time to explain some of the processes in breaking down game film and how they use the information to improve player performance. Anyone, that has ever broken down film, knows it is a painstaking process, but the passion Gavin showed for his craft was awesome to see and he gave us a wonderful look into his world as well as a some great takeaway ideas. After finishing at Scotstoun, we were whisked away to our hotel for a quick shower and then we were back out the door. This time, we made our way to the train station for a ride south to visit with the Ayr Rugby Football Club. Being that we were going on 24+ hours without sleep, most of our crew dozed off a bit during the ride. One of the top clubs in Scotland, Ayr has a traditional community club feel to their operation. Founded in 1897, they have men’s, women’s, and youth teams at every level. Their Men’s 1st XV is near the top of the table in the BT Premiership, which is the next level down from the professional teams in Scotland. This was one of the reasons that Nathan wanted us to meet with them as community is at the heart of our club in Clayton. We were met by Stuart Fenwick and Glen Tippett whom are both coaches and rugby development officers for Ayr. We also met with Club President Billy McHarg. They gave us an overview of their operations and we had a wonderful discussion on community development, their Ayr Academy set up and thinking outside of the box in regards to generating revenue. 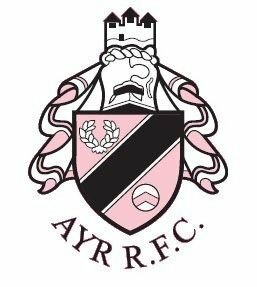 Behind the traditional rugby club exterior at Ayr is a forward thinking leadership group. A quality that is very appealing to us as we shape our long term plans in Clayton. After getting club ties presented to us by Billy and picking up some kit in their team store, we headed outside to watch the evening training session with their teams. 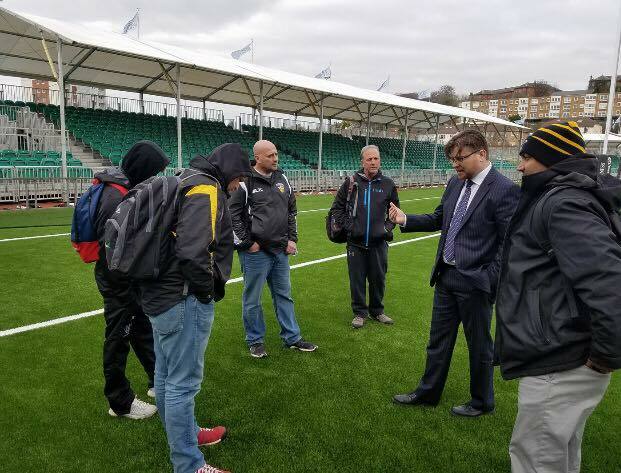 A couple of us headed over to watch their BT Premiership Men’s side while others watched on as their U16s and U18s prepared for their National Championship matches on Friday night at Murrayfield. Top notch programs, coaching, and people. As the training sessions drew to a close, we headed back indoors for dinner and a drink with our hosts. The conversation continued and seemingly would have continued on even longer had we not been up for almost 30 hours at that point and needed to catch a train back to Glasgow. It was a wonderful cap to our first night in Scotland. I’m not sure any of us even remember how we got back to our hotel, but somehow we made it and crashed immediately.